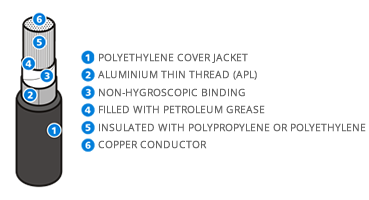 Fabrication: Electrolytic copper conductors, insulated with polyethylene jacket. The entirely group of insulated wire has the empty area fulfilled with a humidity proof material and protect with APL cover. Put into practice: Indicated to subterranean installation, buried in land or in ducts.